I’ve been meaning to write this post for ages. And now I’ve started, I realise that I don’t have much to say that will add to the brilliant tutorials already out there. So, I’m going to link to those tutorials. No point reinventing the wheel. I got a Raspberry Pi for Christmas. Not the type with pastry, the circuit board type with a world of joy inside. Since I’d been wanting one for the best part of a year, I figured I’d better make good use of it. Find a good mobile phone charger which matches the power specs the Pi needs, 5V 700ma. Any less and it won’t work. You will also need an SD card, 2Gb minimum. Use the guides here to download and install your OS http://www.raspberrypi.org/downloads. I chose to use Raspbian, despite wanting XBMC. Buy a USB hub with AC power. The Pi has two USB slots which can cope with a mouse and keyboard, but any more and the power drain will cause the Pi to cut out or the peripherals to fail. If you want to add a wireless adapter or an external drive, a powered hub is a must. Get hold of an HDMI cable, or a composite AV cable if you don’t have an HDMI capable telly. If you want to talk to the outside world you will also need an ethernet cable, at least to start with. Plug in key board and mouse, ethernet, connect to TV, insert SD card, then power on. I also had a laptop nearby to follow tutorials with, and the official guide to the Raspberry Pi. A basic understanding of Linux does help, but it’s not essential. And beer. Did I mention beer? I wanted to do one thing immediately – set up a Media Centre. I don’t have an internet enabled TV and I wanted one! A lot of Googling and research convinced me that XBMC was the way to go. But most guides used Raspbmc as the OS (A dedicated media centre distribution). I wanted to use Raspian. Because I like to be awkward, I guess. One large beer later, we were onto the XBMC setup. If you’re not wanting to Raspbmc ad not up for compiling programs yourself, or have no idea what I am talking about when I say compile, this is the tutorial for you http://www.memetic.org/pre-compiled-xbmc-for-raspbian The only thing it does not include are the libraries to let you work your RPi installation of XBMC using your TV remote. I can live with that. Or I could compile it myself. Which is unlikely. I thought the command had run but the XBMC installation became really glitchy really quickly. I tried the command again and got an error. However, the set up interface of the RPi gives you a basic graphic interface to do the same thing – run sudo raspi-config, and choose the memory split option, and voila! I chose not to overclock the Pi, and considering I am running it over Wifi, my streaming is almost flawless. I also have 5ondemand and had 4OD until the add-on broke. I guess I’ll just have to wait until someone fixes it! And as the icing on the cake, I downloaded the XBMC Android app so that I can use the phone as the remote. Stonking. So, to watch programmes using XBMC, I boot up the Pi, login using tightvnc, run XBMC and then use the phone remote to control it. Then I had a few weeks break. 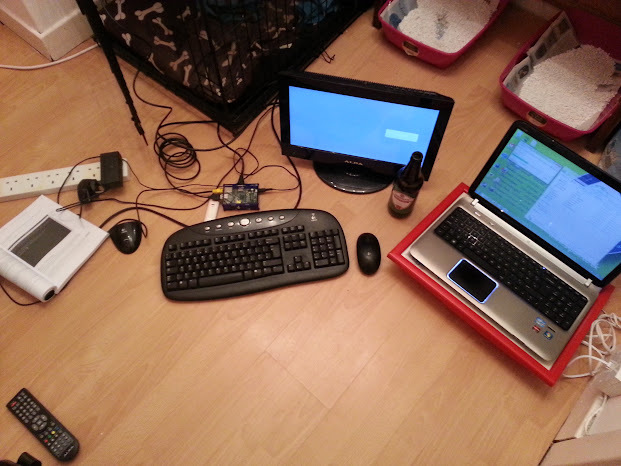 In the last few evenings I have added to the Pi’s skillset. So now I can browse the web from anywhere, securely routing through my Pi, and when I get home I can use it to watch pretty much anything I fancy. For under £50 all told. Note: I am not an expert, I read tutorials and then I press buttons. Fiddle with your Pi at your own risk. It’s not for the faint hearted. But it’s SUCH FUN. Would you say it’s a useful bit of kit or a toy though? Looks like fun but not sure if it’s got a bigger purpose. It’s definitely fun. I think it’s a useful learning tool. But if I’m honest, it’s mainly a toy. Try as I might, I can’t work effectively on Linux for my day job and rely on my Win7 laptop. RPi is my evening sport.